This is the perfect way to tell someone that you're thinking of them, that you wish you were there with them or that you look forward to working with them soon. Each gift presents a variety of American brews, so it's a taste testing experience that your recipient won't soon forget. From a friendly kudos to a major celebration that you can't believe you're going to miss, it's always a great time to celebrate with a six pack of flavorful craft brew. I got this basket for my dad as a birthday gift, and he was very happy with the selection of microbrews. He was familiar with a couple, but was excited to get to try some new ones as well. The package arrived in great condition, nicely wrapped/displayed, and nothing was broken. Shipping was as advertised and I was able to contact customer service for the exact delivery date after it had shipped and they were very prompt with their response. I will definitely consider beergifts.com for additional orders in the future. Thank You! 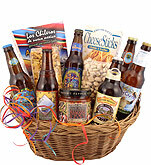 I ordered the Beer Medley Gift Basket as an anniversary gift. It arrived on time, in perfect condition, and the selection included a wide variety of different kinds of beers to say nothing of the snacks to go with it. Overall, a great choice at a reasonable price. The person I sent it to seemed very please with the choice of beer and said the snacks were good so I was happy. On time and beautifully wrapped! My friend loved it and the beers are uncommon and very tasty. This was a gift for a friend who had surgery. He liked it very much.